The existing St. Camillus healthcare campus sits on 22 acres in Wauwatosa, WI, on the western border of Milwaukee. The campus has a total of 550 residential units spanning all levels of care from independent living to full nursing care, from more than 500 St. Camillus employees. Our building is part of the first phase of an expansion that includes 120 new assisted living and nursing care residential units. The first phase of expansion, expected to be completed November 2017, includes the St. Camillus Jesuit Community. A second phase of expansion includes 144 independent living units for the general public. When both phases are completed, the St. Camillus healthcare campus will have 750 residential units. The St. Camillus Jesuit Community is designed to provide care for 50 men with needs ranging from assisted living to full nursing care. We will not simply be building residential rooms, but a full Jesuit community. In addition to the residence rooms, there will be a Jesuit chapel, dining room, recreation room, haustus (snack) room, TV room, library, activities room, treatment room, fitness room, storage room and three guest rooms. 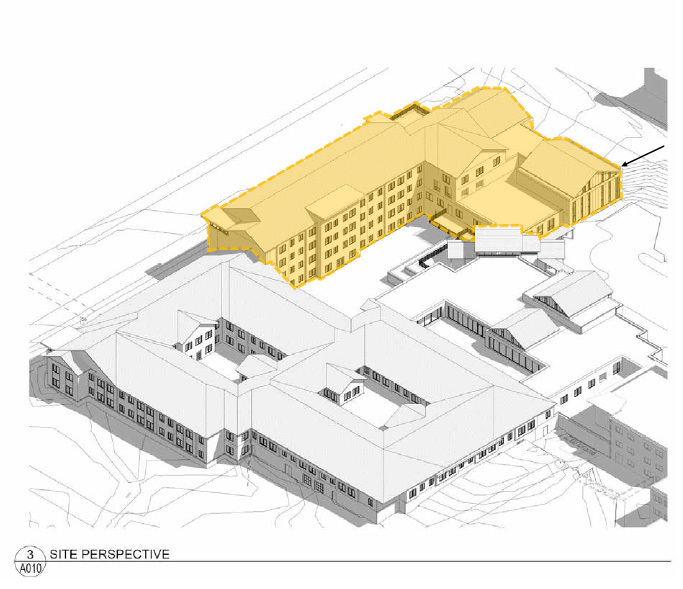 The Jesuit community building will share some systems (such as chiller, boiler and electric room) and some functional capabilities (such as food preparation and maintenance) with the adjoining St. Camillus building. Our building will total approximately 53,000 square feet. What makes Jesuit Senior Healthcare Different? 1. Shared common life Jesuits live in community from the time they enter the Society. Community life is a hallmark of what it means to be a Jesuit. 2. Ongoing service The saying that “Jesuits never retire” is true. There is no mandatory age when a Jesuit retires. His life of service extends into his senior years. It is not surprising to find senior Jesuits in their late seventies and eighties in active ministry, living in a local Jesuit community. 3. Communal poverty Jesuits take a vow of poverty so that they are dependent entirely on their community for support. While a Jesuit may serve as a pastor, professor or president of a school, this vow of poverty impacts his benefits. As a result, when a Jesuit’s health requires that he receive additional care, he has no personal resources, pension or benefits from his previous institution. Why Partner With St. Camillus? With a facility and caring professionals already in place, and with years of experience caring for our senior Jesuits, St. Camillus is a logical choice for our Jesuit Senior Care community. The lease with St. Camillus gives the Midwest Jesuits the ability to add or subtract the number of rooms as needed, and St. Camillus will run all the healthcare services for the Jesuit community. Why Support Senior Jesuit Healthcare? Though Jesuits may not serve in active ministry forever, they maintain a ministry of prayer when they ‘retire’. All Jesuits take a vow of poverty. It is the Midwest Province of the Society of Jesus– not the Jesuit institutions where they have served or taught– that care for all Jesuits' healthcare and retirement needs. The Midwest Jesuits have more than 110 Senior Jesuits in need of healthcare and two thriving Senior Jesuit residences in the Province. The healthcare needs of the Province mirror that of families who are caring for parents and grandparents. Careful planning and partnership have laid the foundation of Jesuit Senior care for these men who have lived lives of service. Financial support from donors for Senior Jesuit Healthcare is essential to the continuum of care for these men of service.